I did not make up this curve. The research that determined it is documented in Sleep Onset: Normal and Abnormal Process, edited by Ogilvie and Harsh, page 25. As you can see, our propensity to sleep starts to increase in early evening and only reaches a maximum in the early hours of morning. That bump in the afternoon is what some of us call siesta time. Many cultures recognize the need for a nap and close shops to afford the time for an afternoon siesta. If this propensity curve works in our favor, why don’t we all get a good night’s sleep? Glad you asked. 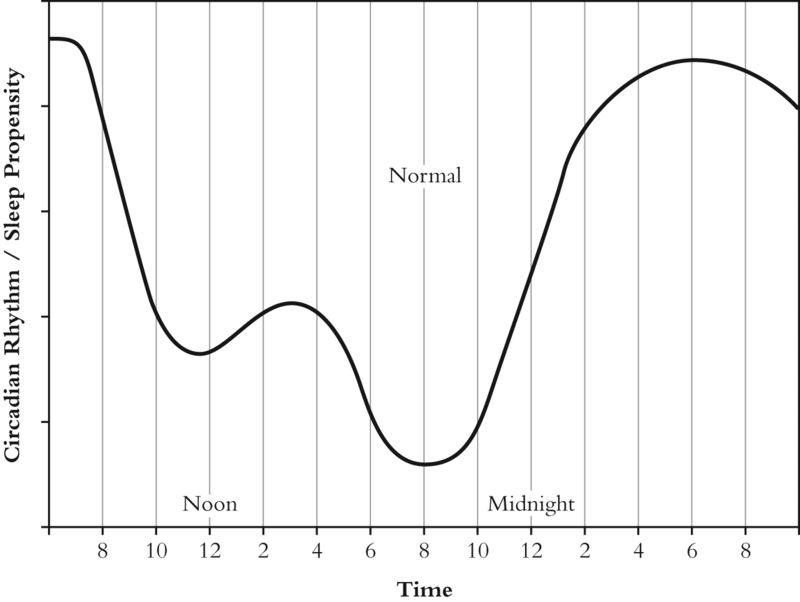 The above sleep propensity curve is normal only for people who have no problem getting to sleep and staying asleep throughout the night. If they do wake — to go to the bathroom or check on the kids — they get back to sleep quickly and with little trouble. For the rest of us, we either can’t get to sleep to begin with or have difficulty getting back to sleep once we wake up because our sleep propensity curve has holes in it. What happened to our sleep propensity curve? Were we born wrong? No. Turns out, sleep propensity is malleable. If we lie awake initially, or get woken up at the same time night after night, our sleep propensity adjusts to that new normal. This is where the holes come from. So how do we go about repairing it? Is that even possible? Repairing the sleep propensity curve is definitely possible. All you have to do is get to sleep quickly and stay there, night after night. If you do wake in the middle of the night, you must get back to sleep quickly. Sounds like the chicken and the egg. I can’t get to sleep because I haven’t been able to get to sleep. You are right. That is the crux of the matter. You must have a way of getting to sleep reliably every night, and one that will get you back to sleep as soon as possible after waking. To accomplish this you have to go get sleep. Sleep is not coming to you. If you have insomnia, you have proven sleep’s elusiveness night after night. Where would I find such a method? You would find it in In Pursuit of Sleep, The Origins of Insomnia and What to Do About It. The method is called the Transition Trek. It teaches you how to push aside those thoughts that are raging in your mind and focus on images and sounds of a Transition Trek that leads you to sleep. You can learn the method by reading only the first four chapters of In Pursuit of Sleep, which shouldn’t take anymore than an hour. Then you can start the method that very night. You don’t have to spend weeks training yourself to think of your bedroom as only a place to sleep. No, your bedroom doesn’t have to be absolutely dark. No, you don’t have to get rid of all extraneous sounds. You don’t have to cover your clocks and put your iPhone in the next room. You don’t have to get rid of your restless sleeping partner. You just have to concentrate on going to sleep using the Transition Trek method. Every time you wake, for whatever reason, the Trek is there inside your head waiting to put you to sleep.